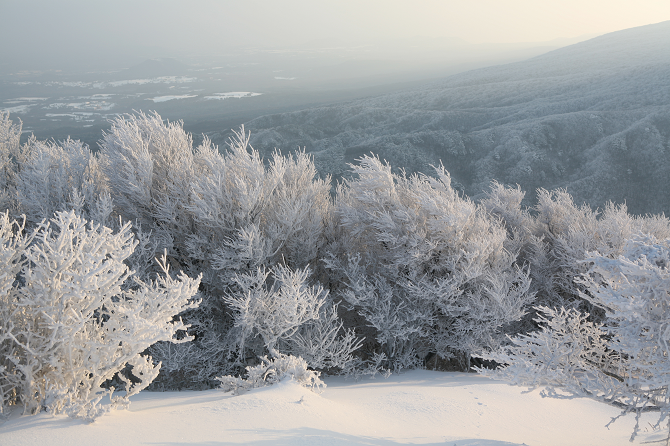 Jeju’s scenery takes on a whole new appearance in winter as the upper regions get covered in a blanket of white snow. This means that some of the most spectacular scenery of the year can be found during this time of year. However, even if you don’t want to venture out in the snow, the lower regions are still mostly untouched due to the island’s relatively mild climate. Whether you prefer the snow or the slightly warmer coastal areas, winter can be one of the best times of the year to go hiking on Jeju. 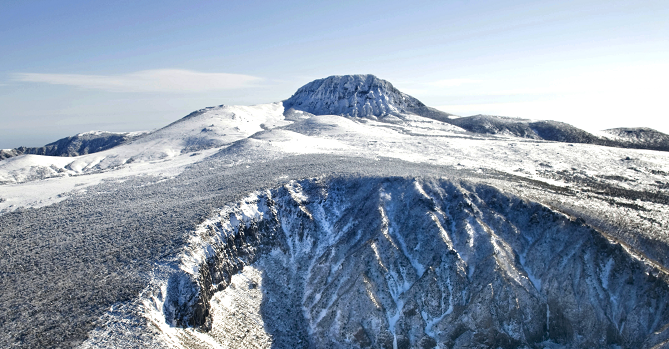 Here are four great hikes that you can do on Jeju during the winter! Throughout most of the winter, much of Mt. Hallasan is completely covered in snow. This makes it a beautiful place to hike and a completely different experience to the one you would get in winter. As one of the shorter courses, the Yeongsil Trail will take about 2~3 hours and the total length of the course is about 5.8km. If you want to stretch your legs this winter but don’t feel up to hiking Mt. 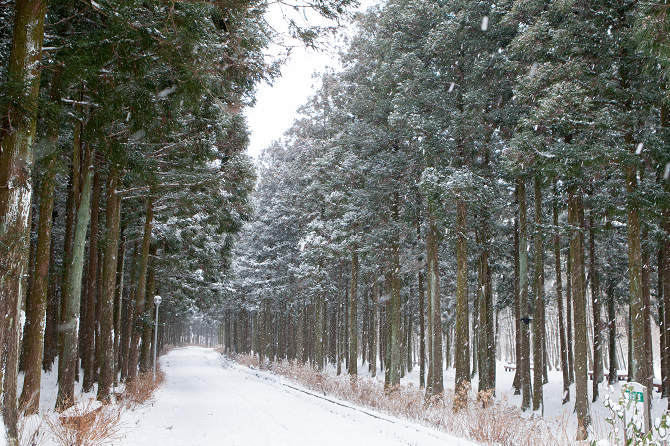 Hallasan, then taking a walk through one of Jeju’s forest could be the perfect way to go. At Jeju Jeolmul Natural Recreation Forest, there isn’t much of an incline and you can walk it slowly. This means that it can be a great place to go to take a stroll with kids, old people, or those with disabilities. Walking around the trail will take about one hour. During your hike, there is even a horseshoe-shaped observatory where, on a clear day, you will be able to see Seongsan Ilchulbong Peak to the east side, Musu river to the west side, and a view of Jeju City to the north. 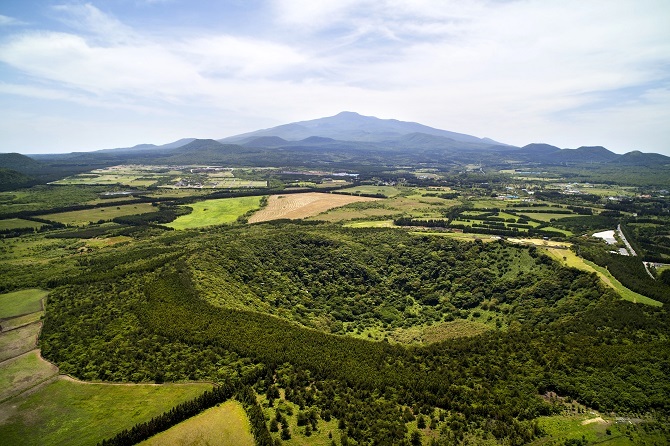 While when you think of craters on Jeju you may think of Baengnokdam at the top of Mt. Hallasan or the crater at the top of Seongsan Ilchulbong, neither of these come anywhere near to the scale of Sangumburi Crater. 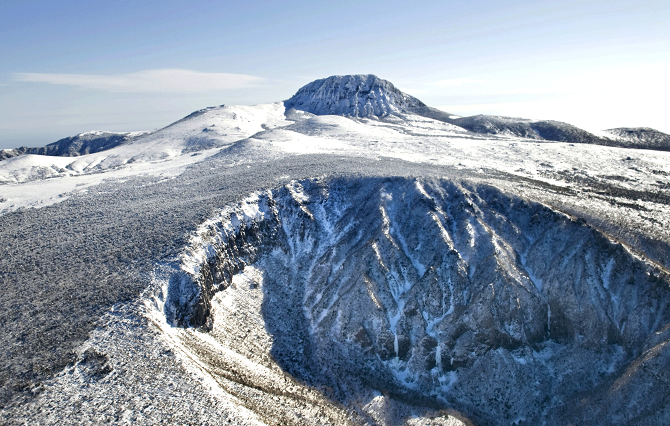 The crater has a circumference of over 2 km and at its deepest, it is 100 meters deep. It is known for the plant life that grows in the crater as well as the views of the surrounding forests, fields, and even Mt Hallasan itself. If you go at the right time you could even be treated to a beautiful sunset! Eoseungsaengak is a trail that goes to one of Jeju’s highest peaks. Much of the trail is covered in beautiful Jeju forest, while at the top you will get some incredible views of Mt. Hallasan and the island. The path is well made with steps in the more difficult places. The path is also quite short which means it is great for travelers who want to do some hiking on Jeju but don’t have time to climb to the top of Mt. Hallasan.